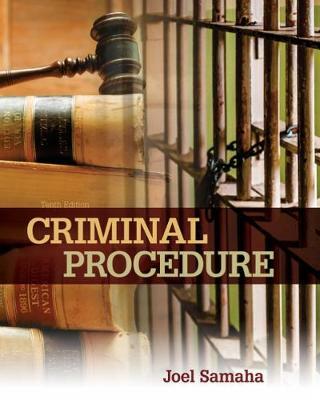 This straightforward introduction to criminal procedure combines case excerpts with clear, detailed legal discussion and analysis to equip you with a solid understanding of the field. Widely acclaimed author Dr. Joel Samaha is known for his ability to help readers grasp the complexities of law by clearly and carefully presenting all sides of an issue. CRIMINAL PROCEDURE covers the whole criminal process -- from crime prevention and investigation by law enforcement to court procedures before trial to sentencing and review by appeals courts. You'll read about criminal procedure in the digital age, law enforcement crowd control and the First Amendment, police body cams and citizen smartphone videos of police encounters, and trial judge review of search warrant applications based on digital sources such as smartphones. Other topics include the political nature of the U.S. Supreme Court and developments in forensic evidence acquisition, enhanced interrogation, and immigration law.